During the winter, heat is a “nest”cessity. But how you choose to heat your home should be something you decide. Well, with Swanton Energy Services, it is. Our company does what others don’t. We give you heating options. So, in addition to our forced air systems, we offer boilers. This heating alternative relies on hot water instead of air to keep your home warm and toasty. From bathing to cooking, water plays a pivotal role in your home and, ultimately, your life. Well, a boiler expands the jobs water must do in your home. You see, with this alternative heating system, water is responsible for keeping you cozy. Let’s explore how a boiler operates. First, a boiler heats the water inside your tank. Then, once this H2O reaches the right temperature, it’s sent through your home’s network of pipes to heat your space from the ground up. This unit delivers a difference in comfort you can feel—with whisper-like precision. By relying on radiant heating, a boiler not only delivers reliable warmth, it also leads to boiling hot benefits! With a forced air system, warm air has to travel through air ducts before it can enter your home. Unfortunately, up to 30 percent of this heated air can seep out of your ducts before it has a chance to reach you—and that’s a lot of wasted energy. But boilers do things differently. They ditch the ducts and deliver warmth through your home’s pipes instead. 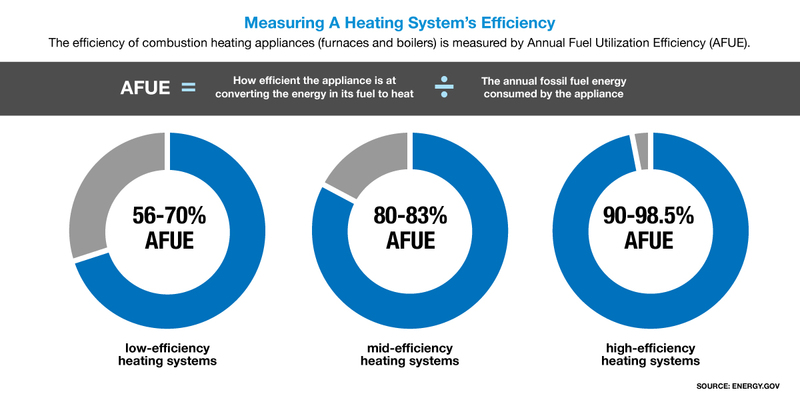 So, with a boiler, no heat is lost and plenty of energy is gained. On top of that, water is a great thermal medium. Not only does it have the ability to retain a large amount of heat for a long period of time, but your water temperature can be precisely controlled and measured. 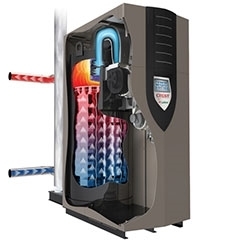 Because of these unique properties, boilers heat your home in an extremely energy-efficient manner. Air rises when it’s warm and sinks as it cools. Because of this, if you choose to operate a forced air system, you could experience hot and cold spots throughout your home. On the other hand, a boiler transports heat through your pipes. As this heat radiates from the pipes nestled in your home’s walls and floors, it delivers even heating. The quality of your home’s indoor environment has a direct effect on the comfort and health of you and your family. As a forced air system circulates warmth, it can spread pollutants and other harmful airborne contaminants throughout your space, which diminishes the quality of your home’s air. This, in turn, can compromise your health. However, a boiler radiates, rather than circulates, heat. Because of this, a boiler does more than keep you comfy. It can help keep you healthy, too. When you’re ready to feel the difference in comfort and savings a boiler radiates, fill out our online form or call us at 732-335-6731 today! Whether you’re looking for a gas or oil boiler, our professionals are confident you’ll warm up to the dependability and energy efficiency of the systems we offer—and your budget will, too. You see, choosing to install a boiler from one of our preferred brands will cut your fuel bills by up to 40 percent!